Rushing DLC to market based on Lords of Shadow's success was "a mistake." If you were disappointed with the DLC for Castlevania: Lords of Shadow you're not the only one. Developer MercurySteam now admits that developing the add-ons, titled Reverie and Resurrection, was "a mistake." While the original game hit store shelves early October in 2010, the DLC was released the following March and June - a timetable producer Dave Cox characterized as "rushed." While five and seven months, respectively, may seem like plenty of time, the DLC wasn't part of the original plan. 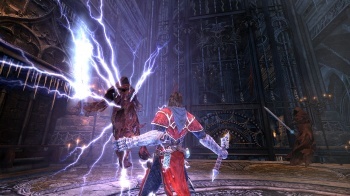 Cox explained that, because of Lords of Shadow's unexpected popularity, the team felt like they had to put DLC on the market as quickly as possible. He further elaborated, "when you have success there's pressure on you to bring something else to market very quickly. And I think it was wrong of us to do that." The DLC wasn't a total loss, as Cox asserts that it "enriched the story that we wanted to tell." But the lesson is learned - if the team does decide to create DLC for the sequel, Castlevania: Lords of Shadow 2, it will be planned from the start. Additionally, it won't be tacked onto the original game's ending; Cox suggested that it might instead be a side story that "enriches" the main plot. In a market where 'day-one DLC' is both a common and commonly-reviled marketing catchphrase, Lords of Shadow's rushed DLC shows what can happen when a developer doesn't account for future expansions to a game. That doesn't mean MercurySteam plans to go to the other extreme, though; Cox pointed to Skyrim as a model for good DLC, saying it should be an expansion of an already-complete game rather than a missing piece. Cox didn't say if there would be DLC for Lords of Shadow 2, but we should find out by the time it hits consoles in 2013.